We are delighted to announce the BC Live Awards 2018 are being held on the 5th December at The Savoy, London. We have been celebrating the achievements of our sector for over 80 years – hosting our popular Christmas networking drinks and lunch. After the huge success of last year’s BC Live Awards event, this year we will be presenting 6 new awards voted for by a panel of judges and nominated by you. Designed to recognise and celebrate excellence across the whole of the supply chain, our awards are focused on innovation, raising standards, promoting best practice and recognising & encouraging new talent in the industry. Mick Miller is often referred to as a comedy legion, a term which he finds difficult to accept, because those that know him will tell you that he is a modest, unassuming “normal” bloke. It’s when he’s on stage in front of an audience that he comes to life. 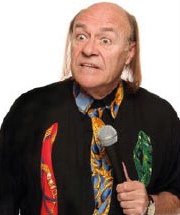 He is often referred to as “The bald guy with the long hair” and that unusual hairstyle has been his trademark since he started in comedy in the mid-1970s. Amazingly, when he recently appeared in the ITV series, “Last Laugh in Vega” the American show produce told him to get his hair cut, which started the Twitter #SaveMickMillersHair campaign.